Improve the continuity and quality of services offered for families with children aged 0 to 5 years old. Consolidate and/or create local resources devoted to improving families’ quality of life. Improve collaboration and links between the different number of organizations and stakeholders working for families in the region. To help facilitate and create local coalitions or partner with existing coalitions, in order to represent and defend the needs and concerns of local families. Develop positive perceptions towards people and communities affected by poverty. They have a mandate to work on finding resources to help disadvantaged families. They ensure the follow-up on a project dealing with food safety in community kitchens and help organizations work together in a collaborative manner. They have a mandate to help promote a vibrant family life. 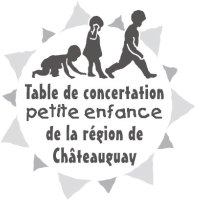 They organize and solicit municipalities to offer family oriented activities, which includes events surrounding the "National Day of the Child" and the "Quebecois Family Week". They work towards the creation of family friendly municipal facilities and municipal family policies. They organize an annual conference based on supporting parents and their role as a parent. They have a mandate to support families and organizations who work with children with speech impediments. They help organize speech development workshops for early childhood workers and also offer parent-child workshops for affected families.